Blues And The Hornet: The Perfect Marriage! To commemorate the F/A-18 Hornet’s upcoming 30th anniversary with the U.S. Navy’s Flight Demonstration Team, the Blue Angels, now would be as good a time as ever to look back and see how the Hornet came to be in the first place. The performance of the Hornet made it a superb choice for the Navy’s demonstration team, and in 1986, they fielded the Hornet for that year’s show season. Previously, the Blue Angels had flown the venerable Douglas A-4 Skyhawk, which they had flown since 1973. Initially flying “A” and “B” model Hornets, the team has more recently been flying the “C” and “D” models, which are still some of the oldest of their types. These jets are significantly modified in comparison to their fleet counterparts, as they have their M61A1 Vulcan 20mm cannon removed to make room for the oil system which supplies the visible smoke trail seen in their demo. If you look closely at the left engine exhaust nozzle on a Blues jet, you can actually see the plumbing for the smoke system, which injects oil into the exhaust stream to create the smoke vapor trail. Also added is a heavy spring to the pilot’s control stick, which helps prevent uncommanded movement of the aircraft during flight. In addition, the fuel pumps are modified, as a standard Hornet cannot maintain inverted flight for longer than a few seconds at a given time. Last but not least, the jets are painted in the familiar glossy blue-and-gold scheme. The jets are flown in a “clean” configuration, meaning no drop tanks, pylons, or external stores of any kind are attached to the jet. The Blue Angels demo is nothing short of exhilarating. If you’ve never had a chance to see them for yourself, just pull up any of the thousands of YouTube videos that have been made over the years. The Blues put on quite a show, turning and burning through the sky in formations as close together as eighteen inches wingtip-to-canopy at times. They showcase virtually every bit of the Hornet’s performance envelope: rom a 120mph high-Alpha pass flown by the solo pilots, to the 700mph sneak pass, flown by the #5 solo pilot. There are also 7.5g minimum-radius turns, and the diamond dirty loop, where the diamond pilots fly the Hornet “dirty”: gear down, tailhook extended, through a full loop. These are but a handful of maneuvers that showcase what the Hornet is capable of. The Hornet has proven itself so versatile that no show has ever been cancelled due to what we often times referred to as a “down” jet (grounded for maintenance issues). That is a testament not only to the Hornet itself, but also to the maintainers who strive to keep the jets airworthy ’round the clock. Compared to the Tomcat, which entered service with the U.S. Navy in 1974, the Hornet is much more maintenance friendly, requiring less man hours and lower costs overall to keep it flying. As with all good things that must come to an end, it appears that the “legacy” Hornet may finally be nearing its end with the Blue Angels. Even with the excellent maintenance work performed by the Blue Angels maintenance team, the jets being flown are old, former fleet jets, well past their prime, and it’s beginning to show. 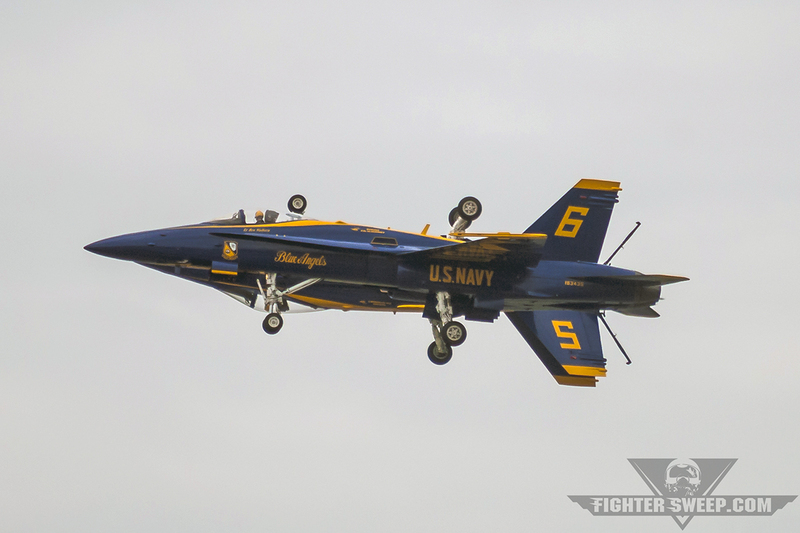 During at least two different air shows roughly one week apart during the 2015 season, there were documented reports of Blue Angel Hornets losing parts during the show, including one leading edge control surface on one of the solo jets. Word has been spreading that the Navy is eyeing the change to the Super Hornet at some point in the near future. How soon the changeover will occur is anyone’s guess, but it won’t happen overnight. This move should bring about a welcome change not only to the pilots and maintainers of the Blue Angels team, but to aviation enthusiasts as a whole who want to see the latest and greatest jet fighters on display. With the oldest Super Hornets in the Navy (the Marine Corps does not fly the Super Hornet) being roughly fifteen years old, the jets should breathe new life into the Blue Angels team until it is replaced many years down the road by something newer and shinier. Part of me will be sad to see the old Hornet jets go, but another part will be happy to see the Blue Angels carry on their legacy in the Super Hornet, a legacy that they have worked so hard to perfect for close to 70 years. 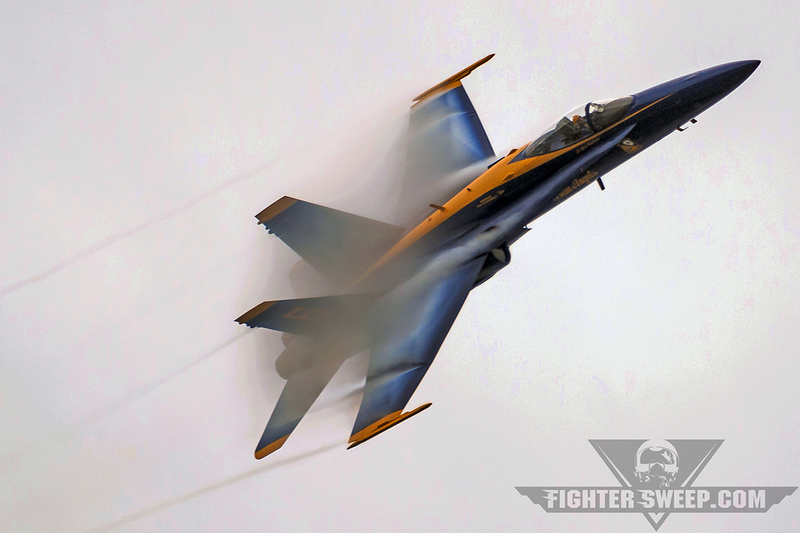 It’s an amazing feat the Hornet has been part of the Blue Angels team for nearly half the team’s lifetime. To the pilots, maintainers, and everyone else involved with the Hornet program since it’s inception, I say Bravo-Zulu, well done, folks! “War Party” Final Checks Prior To Launch! Ask A Fighter Pilot: Hand Signals On The Flight Deck! Blue Angels To Transition To Super Hornet?